Despite the fact that my previous posts about Pinkberry were less-than-favorable, I ended up on the list of bloggers invited to the original West Hollywood location to try a “new taste” they had been cooking up beforeÂ taking it public*. After all, Pinkberry got its first boon virally – and they were going to tap intoÂ its original source of traffic marketing to give them the publicity they wanted again. Ohh…granita. Smoothie. Liquid yogurt. Yogurt Drank. So this is the next accessory. And the point of it all is as simple as being a less threatening driving hazard, since you don’t have to consume this Pinkberry with a cup and spoon – only a straw. Point taken. I think we can relate toÂ that, being metal-encased Angelenos and all. No need to justify anyone else‘s road rage, now. The Drank tasted good. Call me biased – since my verdict on the yogurt had been read so long ago, and repeatedlyÂ – but I enjoyed theÂ granita more than the yogurt. 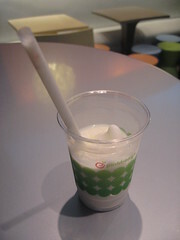 Unlike Caroline, I have yet to try Starbucks’ Sorbetto but I can imagine they are similar. Clearly the exact same in targeted demo, though. But there is a good amount of tang in the smoothie and I think this is the medium in whichÂ I canÂ appreciate the “grit” in the yogurt taste. The granita was alsoÂ filling. When Tim and I mentioned this observation to Pinkberry founder,Â Shelly, she exclaimed, “Good!” while giving us two thumbs up. 😉 So as for meal substitute, the granita can definitely fill that role if you happen to not mind being nutritionally challenged. The small sizeÂ had evenÂ made me full, but heck if I couldn’t squeeze another one in just because it was free – and I did. The Pinkberry folks treated us bloggers well. They set up a DJ and gave out goodie gift bags with gift cards, Pinkberry tees and pins. They also made sure we were sufficiently stuffed with either granita or yogurt for the night. So yeah, I admit it. I’ve been seduced by Pinkberry in a kind of one night stand. So as a token of my appreciation, I’m letting you all know that you can try the granita starting tomorrow (Friday, September 12)Â at 6 Pinkberry locations. The ones in the L.A. area are the original West Hollywood store and the one at the Farmer’s Market at Third and Fairfax, connected to The Grove. *Thank you, Tara Met Blog! This entry was posted in Food, Mid-City West, Nerdism, Web, West Hollywood and tagged blog night, frozen yogurt, granita, pinkberry, smoothie. Bookmark the permalink.